Sensen Li was chosen for the 2018 IEEE Radio Frequency Integrated Circuits Symposium (RFIC) Best Student Paper Award. A Ph.D. student in the Georgia Tech School of Electrical and Computer Engineering (ECE), he received the award at the symposium, held on June 10-12 in Philadelphia, Pennsylvania. The IEEE RFIC is the premier integrated circuits conference focused exclusively on the latest developments in RF, Microwave, and Millimeter Wave Integrated Circuit technology and innovation. Li’s award-winning paper is entitled "A 28GHz Packaged Chireix Transmitter with Direct On-Antenna Outphasing Load Modulation Achieving 56%/38% PA Efficiency at Peak/6dB Back-Off Output Power.” Joining Li as coauthors on the paper are present or past ECE Ph.D. students Taiyun Chi, Tzu-Yuan Huang, and Huy Thong Nguyen. ECE Assistant Professor Hua Wang is also a co-author; he is the director of the Georgia Tech Electronics and Microsystem (GEMS) Lab and is the advisor for everyone on this research team. In this paper, the team proposed and demonstrated a packaged 28GHz Chireix outphasing transmitter (TX) for power amplifier (PA) efficiency enhancement at peak and back-off output power (PBO). It utilizes a novel, high-efficiency dual-feed loop antenna (DLA)-based non-isolating power combiner to realize direct on-antenna power combining, and more importantly, outphasing active load modulation. The proposed Chireix TX contains two phase-shifted sub-TXs simultaneously driving a DLA on package. The TX chips are implemented in a 45nm CMOS SOI process and integrated with the DLA by flip-chip packaging. This Chireix outphasing TX design sets the new world record of energy efficiency among all reported silicon-based power amplifiers and transmitters in the K-band and Ka-band frequency range. This 28GHz TX system could replace many types of transmitters in wireless mobile devices, base stations, and infrastructure links in data centers, in particular for mm-Wave 5G MIMO applications. Over the past several years, the GEMS team has been working on merging antenna and electronics to substantially boost energy and spectral efficiency of wireless front-end systems. Merging these two disciplines will enable researchers to break through many existing fundamental or practical limits and open a completely new paradigm for future wireless front-end designs. This paper is another proof-of-concept example of such a new design concept. The work described in this paper is sponsored by Intel Corporation and the U.S. Army Research Office (ARO). 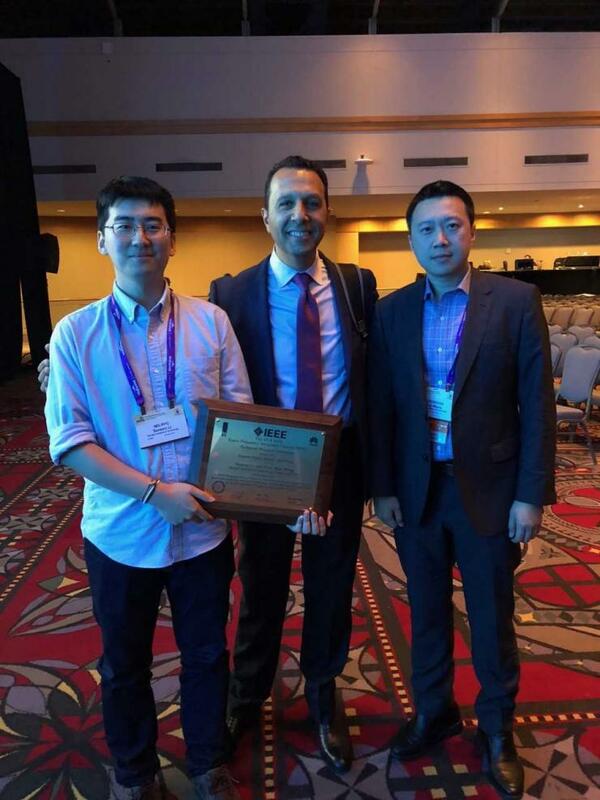 Photo caption: Pictured (left to right) at the 2018 IEEE RFIC Student Best Paper Award Ceremony: Sensen Li (1st Author), Dr. Walid Ali-Ahmad (Facebook, Conference General Chair of 2018 IEEE RFIC), and ECE Assistant Professor Hua Wang.